Without the use of Chemicals - Chemical Free! We Do Not provide Mold Remediation but we do provide the mold assessment and mold remediation protocol (scope of work). Providing both the mold assessment and mold remediation is a substantial conflict of interest and against the state mold licensing statute. Ensure that your Florida or Orlando Mold Remediation is completed correctly the first time. 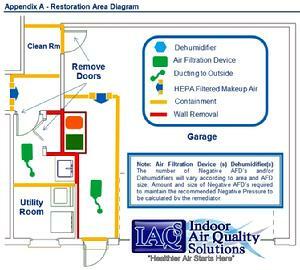 Let IAQ Solutions provide you with a Mold Remediation Protocol specific to your home or office. 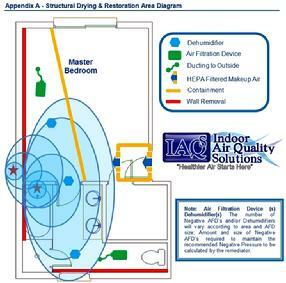 Call IAQS Today for a Free IAQ Telephone Consultation. We'll Make sure it was done right the first time. Mold Remediation is the process of removal and/or cleanup of mold from an indoor environment. Mold Remediation is Not the Killing of the Mold. It is the Safe Removal of the Mold. 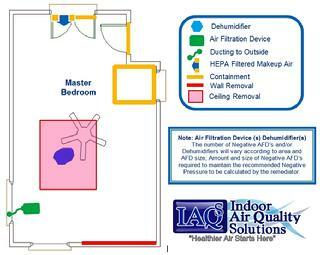 What are the Mold Remediation Contractor Requirements? Orlando Mold Remediators submitting proposals to perform mold remediation in the state of Florida must be licensed by the State of Florida as Mold Remediators and carry a Professional Certification of ACAC Certified Mold Remediator or equivalent. As required by the State of Florida all Florida and Orlando Mold Remediation must be directly supervised by a Florida Licensed Mold Remediator. All Licensed Mold Remediators submitting a Mold Remediation Proposal must include proof of their State License, Professional Liability Insurance, Professional Training and Certification. What are the Standards for Professional Mold Remediation? 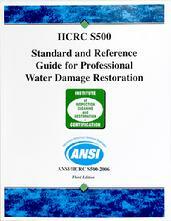 A procedural standard and reference guide for the remediation of mold damaged structures and contents. Based on reliable remediation and restoration principles, research and practical experience, and attempts to combine essential academic principles with practical elements of water damage restoration for technicians facing "real-life" mold remediation challenges. The S520 provides a philosophical shift away from setting numerical mold contamination action levels. Instead, it establishes mold contamination definitions, descriptions and conditions (1, 2, 3). The S520 offers general guidance which, when properly applied, can assist remediators and others in determining criteria that trigger remediation activities or confirm remediation success. Contaminated as the presence of indoor mold growth and/or spores, whose identity, location and amplification are not reflective of a normal fungal ecology for an indoor environment and which may produce adverse health effects and cause damage to materials, and adversely affect the operation or function of building systems. Condition 1 (normal ecology) – may have settled spores, fungal fragments or traces of actual growth whose identity, location and quantity is reflective of a normal fungal ecology for an indoor environment. Condition 2 (settled spores) – an indoor environment which is primarily contaminated with settled spores that were dispersed directly or indirectly from a Condition 3 area, and which may have traces of actual growth. Condition 3 (actual growth) – an indoor environment contaminated with the presence of actual growth and associated spores. Actual growth includes growth that is active or dormant, visible or hidden. 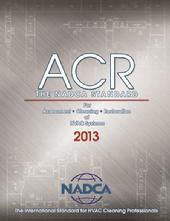 In adddition to the IICRC S520 Standard and Reference Guide for Professional Mold Remediation there is the IICRC S500, Standard and Reference Guide for Professional Water Damage Restoration and the National Air Duct Cleaners Association (NADCA) ACR 2013 the Assessment, Cleaning, and Restoration of HVAC Systems. One of the most important responsibilities of your Licensed Mold Assessor is to create a Mold Remediation Protocol specific to your loss. This is critical in all Florida and Orlando Mold Remediation jobs. 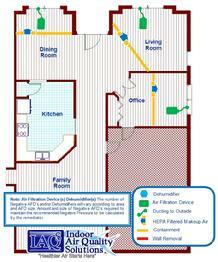 The mold remediation protocol should include a floor plan identifying the water and mold damaged areas of your home or office as well as the amount and area of water and mold damaged bulding material that must be removed. When incomplete or poorly written, the mold remediation protocol can increase the cost of the mold remediation for the property owner as well as create possible liability for the remediation contractor. 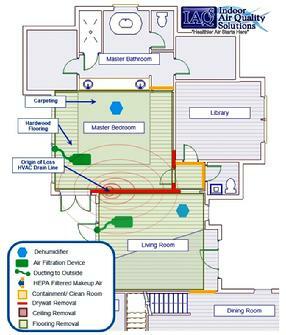 A Mold Remediation Protocol outlines the needed actions for any necessary mold remediation. Each plan is individually prepared based on the Indoor Environmental Consultants Mold Assessment of the property the size and area of the mold contamination. 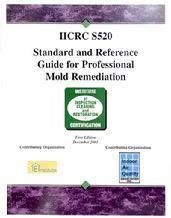 A properly prepared Mold Remediation Protocol should be written according to the ANSI Approved IICRC S-520 standard and reference guide for the remediation of mold damaged structures and contents. The Mold Remediation Protocol will specify the mold remediation containment strategy, decontamination areas, negative air pressure and air filtration(scrubbing), equipment utilization, personal protective equipment, specific cleaning protocols, project completion requirements, site-specific safety plan and clearance testing that will confirm the post remediation goals have been met. Once the Mold Remediation Protocol has been established, the Mold Remediation Protocol can then be utilized to obtain written bids on the cost to carry out the protocol specifications from several qualified and licensed mold remediation contractors. Remember, the goal of mold remediation is to remove or clean mold contaminated materials in a way that prevents the emission of mold and dust contaminated with mold from leaving a work area and entering an occupied or non-remediation area, while protecting the health of workers performing the mold remediation. The goal is not to kill the mold it’s to collect and remove it. It is a Direct Conflict of Interest and against Florida Statute to provide both the Mold Inspection and Mold Remediation on the same job. Mold inspectors should never profit from what they find. The best way to avoid this mold scam is to hire a Certified Indoor Environmental Consultant who is not in the remediation business to conduct a Mold Assessment and write a specific Mold Remediation Protocol for Your home or office. That's the only way to ensure an unbiased Mold Inspection. Engaging in both mold inspections and mold remediation is a serious conflict of interest because the potential for corruption (fraudulently creating thousands of dollars in unnecessary mold remediation) is tremendous. In a perfect world you could trust everyone, but it's not a perfect world. Like every industry, the mold business has its share of scammers and con men seeking to profit from your lack of knowledge about mold. If you hire a mold remediator to inspect for mold he will always find plenty of mod to remediate. Remember that it’s a serious conflict of interest for the mold inspection company you hire to "inspect" for mold and also profit from the "removal" of mold as your mold remediator. Many times we find a water supply line leak expanded to unaffected areas of the home by unscrupulous restoration contractors more interested in expanding their scope of work than their displaced clients. Sadly, many unscrupulous companies use a “FREE MOLD INSPECTION” as a tool to justify their inflated mold remediation proposals. These contractors play on your fear of mold and use their testing and inspection to foster and justify this fear. Your mold inspector’s position should always be unbiased, neutral, and without conflict of interest. Be sure whoever you do choose isn’t looking for mold remediation work for their own company. The scope of work outlined in the diagram above is specific to that home and can not be expanded without our written consent. This protects our clients from remediation contractors that may be interested in providing a "Free Mold Inspection" to secure more unsupervised work for themselves. The only industry standard of practice for mold inspections is the ASTM D-7338 Assessment of Fungal Growth in Buildings. The ASTM D-7338 states in Section 7.6.1 Site Map—A site/floor plan should be prepared showing each inspection classification, as determined in 7.5.6. The plan should be sufficiently detailed to allow each area of interest to the assessment to be unambiguously located. The goal should be to remove mold growth by cleaning or removing moldy materials. Dead mold can still pose health risks if you are exposed. 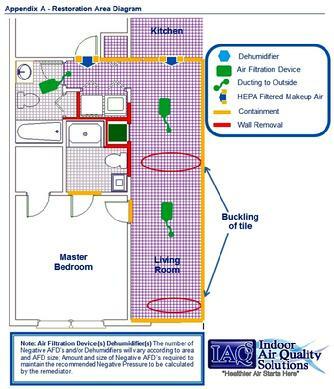 Ozone irritates lungs, and is not likely to be effective at addressing an indoor mold problem. No one should expose themselves or others to ozone on purpose. Address the cause of the mold (usually moisture) and then remove the mold by cleaning surfaces or removing moldy materials. We know that we’ll never be able to eliminate all of the mold from within our home or office. But we can prevent it from growing within our home or office by eliminating the moisture that supports its growth. The sources of moisture that support mold growth include elevations of humidity above 60%, plumbing leaks, and building envelope failure such as roof and window leaks. If mold is found to be growing in your home or office due to an elevation in humidity, leak, or an unfortunate water loss, you need to first identify the moisture source that is supporting the mold growth to correct and prevent continued mold growth. Then, collect and remove the mold and water damaged building material from the indoor environment. Eliminating any one will prevent the mold from growing. What you’re left with is the mold that can become airborne and directly affect the occupants. This mold must be collected and removed from your home or office. We know that there is no shortage of “Quick Fix” Ozone or Chemical using mold remediators out there that will chemically fog your home or office and affordably “Kill” your mold, but guess what? Your mold is still there. Without the moisture you corrected the mold wouldn’t have regrown anyway. Now you have the mold (allergen) covered in a chemical (poisonous both to the mold and humans) and is now a “poisonous allergen” waiting to become airborne and potentially impact the occupants. There is no need to expose anyone to Ozone, Hydroxyls, Biocides, Disinfectants, Fungicides, Anti-microbials, and Encapsulants during Mold Remediation. Our Mold Remediation Protocols are written to protect or clients from the dust up of mold during the removal and the unnecessary use of chemicals. 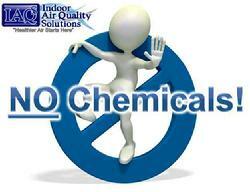 Our Protocols are designed to collect and remove the mold from your home or office without the use of chemicals. Our goal is to protect our Clients from exposure to Ozone, Hydroxyls, Biocides, Disinfectants, Fungicides, Anti-microbials, and Encapsulants during Mold Remediation. The unnecessary use of these products are Forbiden. Ozone, Hydroxyls, Biocides, Disinfectants, se Fungicides, Anti-microbials, and Encapsulants must not be used unless specified in this protocol. If chemical use is specified in this protocol, the chemicals can only be applied in the specific areas identified in this protocol. If chemical use is specified in this protocol the chemicals will be used for the purpose of Disinfection of the Category 3 water damaged areas and not for the purpose of Killing or Removing Mold. If the remediation contractor would like to apply chemicals in any way not specified in this protocol, the Remediator must obtain written permission from the IAQ Solutions IEP. Source removal of mold contamination should always be the primary means of remediation. The Indiscriminant use of antimicrobial products, coatings, sealants, and cleaning chemicals is not recommended. "The use of gaseous, vapor-phase, or aerosolized biocides for remedial purposes is not recommended. The use of biocides in this manner can pose health concerns for people in occupied spaces of the building and for people returning to the treated space if used improperly. The use of a biocide, such as chlorine bleach, is not recommended as a routine practice during mold remediation, although there may be instances where professional judgment may indicate its use (for example, when immuno-compromised individuals are present). In most cases, it is not possible or desirable to sterilize an area, as a background level of mold spores comparable to the level in outside air will persist. However, the spores in the ambient air will not cause further problems if the moisture level in the building has been corrected. Biocides are toxic to animals and humans, as well as to mold. "The purpose of mold remediation is to remove the mold to prevent human exposure and damage to building materials and furnishings. It is necessary to clean up mold contamination, not just to kill the mold. Dead mold is still allergenic, and some dead molds are potentially toxic. Whether dead or alive, mold is allergenic, and some molds may be toxic. 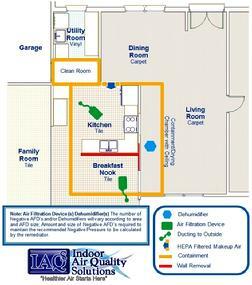 Indoor Environmental Assessment or Mold Inspection. The final step in the mold removal process is a Post Remediation Verification Inspection or Mold Clearance Test conducted to verify and document that the remediation was in fact successful. The Post Mold Remediation Verification Test or Mold Clearance Test should also be conducted according to the ANSI Approved IICRC S-520. The Post Mold Remediation Verification Inspection or Mold Clearance Test should be done before any re-construction work begins so the inspector can visually assessed to ensure the mold has been collected and removed successfully. Many mold remediation contractors offer "FREE" post remediation verification inspections or mold clearance testing. Mold Clearance Testing is vital to the mold remediation process and should never be conducted by the remediation contractor. Insurance companies, mortgage lenders, and prospective buyers of your property in the future will want to see written confirmation that the mold issue was resolved. Post Remediation Verification Inspection PRVI or Mold Clearance Testing should never be performed by a mold remediation contractor waiting to get paid for his work. With thousands of dollars on the line, it is highly unlikely that a contractor will fail his own work. Remember to always have your Post Remediation Verification Inspection or Mold Clearance Test performed by a Certified Indoor Environmental Consultant who does not work for your mold remediation contractor. This will ensure you have a Healthy Home. Mold Remediation Protocol or Mold Clearance Inspection. See our interview on Florida Homes, a leading site for Florida Real Estate, South Carolina real estate, North Carolina real estate & Orlando, FL homes for sale: 5 Reasons Why You Need a Home Mold Inspection. Mold Inspection and Mold Testing Company. 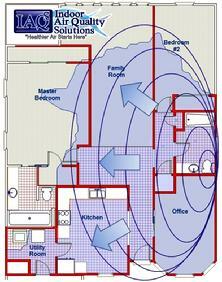 We provide only the mold assessment and mold remediation protocol. We do not provide mold remediation which would not only be a conflict of interest but against Florida Statute. We supervise the Florida Licensed Mold Remediation Contractor as they follow our written Mold Remediation Protocols. After bad experiences with other companies in this field and receiving conflicting advice with poor results and delayed answers etc. John was a breath of fresh air. His knowledge, professionalism, desire and willingness to work with and advise me to ensure that I performed the best work possible to give my clients the best results possible vs. just being a testing company who only cared about getting paid to perform tests regardless of the outcome was outstanding. I will be using him exclusively from now on. Is Your Mold Inspector Licensed by the State of Florida? Our ACAC Council Certified Indoor Environmental Consultants have the experience, training and required insurance necessary to be Licensed Mold Assessors by the State of Florida. I am pleased to share my professional experience with John. I have known John for a couple of years now. He has functioned as a mold assessor. My company has functioned as a mold remediator. John exhibits professional and personal qualities that I respect and place great value on: 1. Professionally, he is meticulous and does not accept work that does not meet or exceed industry standards. 2. Personally, he exhibits the highest ethics with respect to his work and the greatest respect for his clients. I have repeatedly referred my clients to John for their mold testing needs. John is very experienced in his field and conducts himself in a very professional manner. His equipment is top notch and I consider him to be a leader in his profession. I would highly recommend using Microshield on your next project. All American Water Restoration, Inc.